Founded by Mr. Rasheed Ahmed, RSA Geolab, LLC is a full service geotechnical and geosynthetic testing Laboratory. Backed by Mr. Ahmed´s experience spanning over three decades, RSA Geolab, LLC has the ability to respond to testing needs quickly, efficiently and at the right price to our clients. Mr. Ahmed and his staff have handled testing for major projects throughout the United States. When required he has established and directed onsite laboratories at key projects. He has also served as an Adjunct Professor at the Stevens Institute of Technology in Hoboken, NJ. At RSA Geolab LLC, we strive for excellence and understand the importance of geotechnical/geosynthetic testing in a world where waste production and civil construction isn’t slowing down anytime soon. We understand our clients have strict deadlines to meet and delays in results can dictate project progression. Therefore, when clients approach us with their projects, they can expect dependable testing achieved with fast turnaround times. Let us show you why so many of our clients decided to choose RSA Geolab for their geotechnical needs. We’re committed to not only providing quality results but going above and beyond to ensure our customers are completely satisfied. We welcome you to look through our site to see all we have to offer. 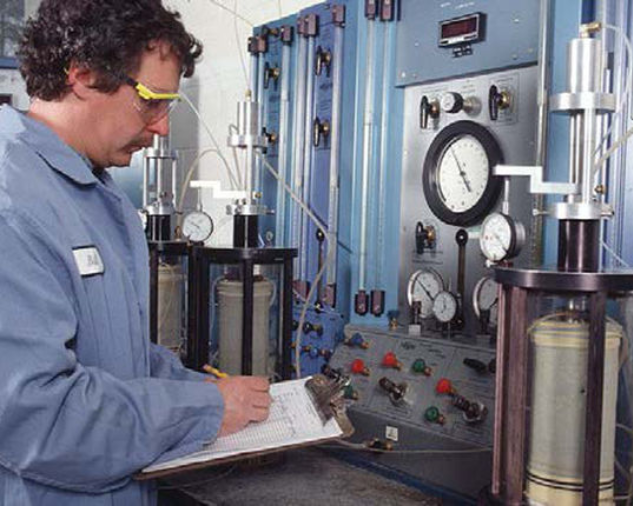 Laboratory testing procedures and equipment are subject to routine audits by both internal and external quality assurance/quality control personnel. Our accurate and reliable results are based on strict adherence to guidance provided by the American Society of Testing Materials, AASHTO, the Geosynthetic Research Institute and the U.S. Army Corps of Engineers. Is designed to produce tensile property data for the control and specification of a planar product manufactured from polymeric material, which is used with soil, rock, earth, or other geotechnical engineering related material as an integral part of a man-made project, structure, or system. Is a physical property which measures the ability of the material to transmit fluid through pore spaces and fractures in the presence of an applied hydraulic gradient. Darcy's Law defines hydraulic conductivity as the ratio of the average velocity of a fluid through a cross-sectional area to the applied hydraulic gradient. A direct shear test is a laboratory or field test used by geotechnical engineers to measure the shear strength properties of soil or rock material, or of discontinuities in soil or rock masses. Testing methodology covers the determination of the consolidated drained shear strength of a soil sample in direct shear. Committed to exceeding your needs. Questions, comments or special requests? We’d love to hear from you, so don’t hesitate to reach out today.